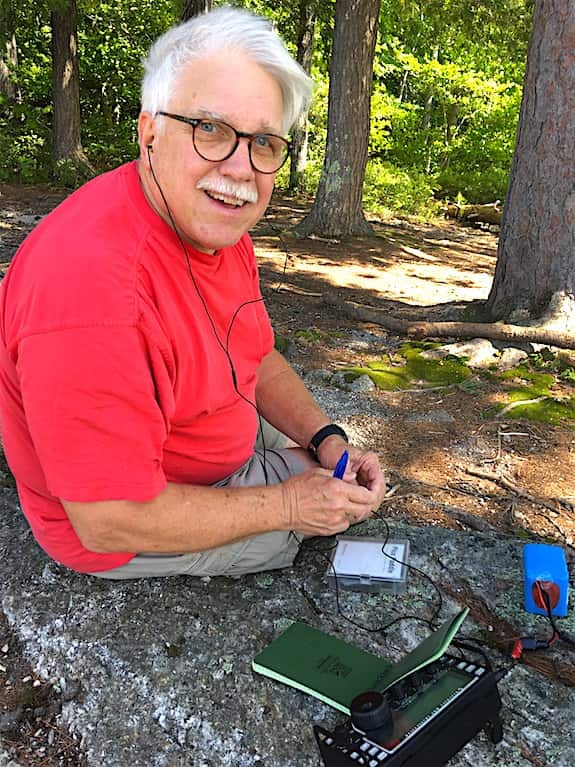 Note from Publisher, W3ATB – Tim Carter: John Shannon, K3WWP, granted me permission to reprint this story about his incredible feat of making at least one QRP contact every day for over 24 years. It’s a record that may stand for many many years. I asked for his permission to reprint the story so it could be curated on at least one more website. I’ve made arrangements in my will that this website not disappear so as to allow great stories like this to endure as an inspiration for amateur operators who have not yet been born. Thanks, John, for allowing me the pleasure to post you fabulous tale. Here’s John Shannon at work extending his stunning streak. On August 4, 2018 when I worked N1QY at 0014Z on 40 meters, my QRP/CW/simple wire antenna streak reached 24 years of age. Let’s see, that translates to 288 months or 8,766 days which means approximately 210,384 hours have passed since the streak started. Time sure passes fast. It seems like not too long ago I was excited that the streak reached 1 full year on August 4, 1995. Those 365 days doesn’t seem like much now compared to 8,766 days. It makes me feel old to think about it. I still enjoy getting that QSO each and every day though. Perhaps this is the first time you’ve read much about the streak. I’ll start off where all stories start at the beginning and go from there. A lot of the material on this page does not need all that much updating from the previous times I’ve updated it so I’ll let a lot of it stand as it is (was), but I will update all the statistics involved. Due to work and other reasons, I had been inactive in ham radio for about 10 years starting in 1983. Then in the early 1990s, my former next-door neighbor Eric (now KB3BFQ) who was 15 at the time expressed an interest in ham radio after seeing my collection of QSL cards and various awards I had garnered in my previous active days. We thought it would be nice to get my station together again and get back on the air so he could see firsthand what the hobby was all about. I dug out my old gear from its resting place in the attic and the corner of my unused shack. It took a little bit of doing, but with Eric’s help, we did get it up and running again. At that time, it consisted of my homebrew transmitter originally built back in 1963 when I got my Novice license and subsequently modified several times. Originally it was a 75 watts (input) rig which probably put out about 50 watts or so. When I got back on the air a second time in the early 1980s after the first layoff of about 8 years, it was modified to about 30 watts or so input and maybe 20 or so out. I also ran other powers in that period down to 12 watts input. This third time it was resurrected as a QRP 5 watts or less output rig. That was the beginning of my operation as a QRP operator according to the current definition of 5 watts output or less for CW. Actually, when I was licensed in 1963 and for some years beyond that, the definition was 100 watts input or less. I don’t know exactly when the change in definition took place. I must also mention the receiver was an ICOM R-71A which served me faithfully for many years when I used separate transmitters and receivers. With Eric in the shack, my first QSO of my third major period of activity took place on February 15, 1993, when I worked K3DQ in MD. That really got Eric hooked and me excited again. We continued to make QSOs including contest QSOs which Eric enjoyed very much. 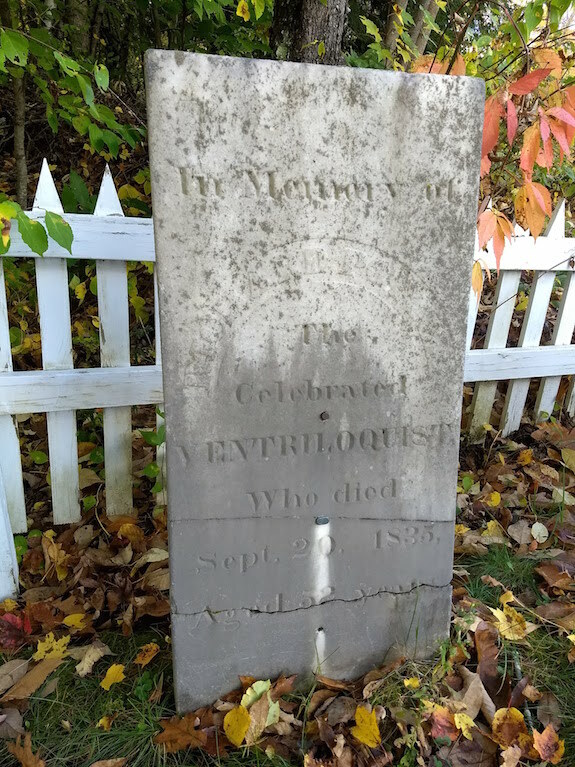 He would help out with some multiplier checking, a bit of spotting when he got better with Morse Code, and one other thing I remember was him using a map in the state QSO parties to track the mobiles to try to figure out what their next county would be. The streak started around a year and a half later. It was suggested by Eric when we were in my shack talking about sports records. Many sports records are for doing something consecutively such as getting one hit or more in consecutive baseball games. That record belongs to the great “Yankee Clipper”, Joe DiMaggio, who did so in 56 consecutive games. 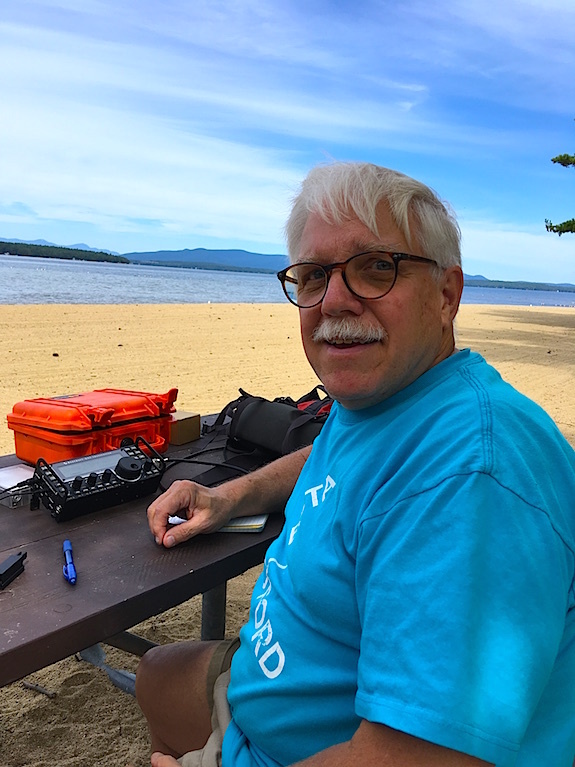 We wondered what kind of comparable record could be attempted in ham radio, and Eric came up with the idea of making a QSO on consecutive days. It would have to be done using my minimal station setup consisting of QRP, CW, and simple wire antennas. Looking back in my logs at the time, I found the first day going backward without a QSO was August 4, 1994, so the first QSO in the streak turned out to be with Chuck KG9N/C6A on August 5, 1994. Many years later, KG9N read about the streak on my web site and very kindly offered to send a belated QSL card to commemorate the beginning of the streak. The rules for the streak were simple. Just make at least one QSO a day using QRP, CW, and simple wire antennas. I decided to use UTC days rather than local time days since UTC is the generally accepted system of dates and times used in ham radio. 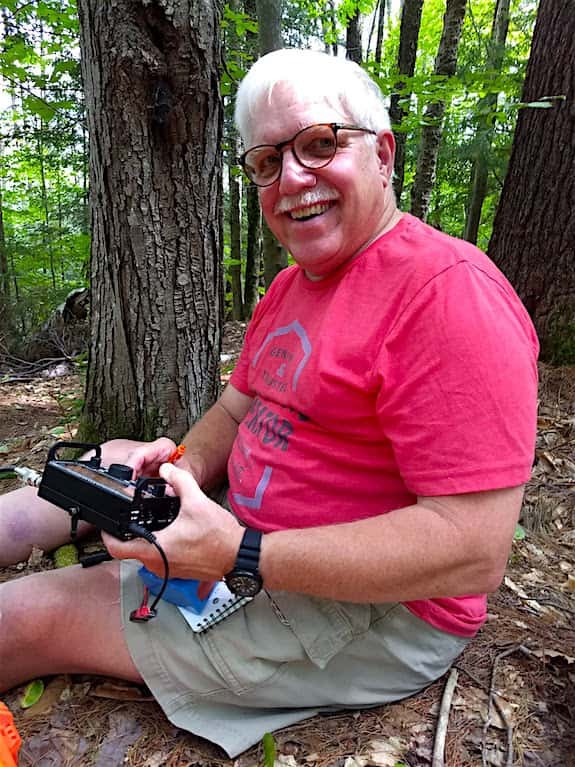 That meant my search for a QSO began each evening at 7 PM EST or 8 PM EDT which was a generally active time on the bands enabling me to make my QSO near the beginning of a day. I have gotten my streak QSO in the 0000-0200Z period on the vast majority of days. My antennas then and now consist of a 110 foot end fed random wire for 160-30M mostly in my attic with a short extension down to my tiny backyard, a 20M dipole (flat top inverted vee to be more accurate) in the attic, a 15M vertical dipole on the side of my house also used for 17 and 12M, a 10M sloping dipole on my porch roof, and a rotatable 6M dipole in my attic. That’s it other than my occasional portable operations with NAQCC WPA Chapter members Tom WY3H, Mike KC2EGL, Tom WB3FAE, Don K3RLL, Jody K3JZD, Jon AB3RU, Ken N3CU, and others at the local Kittanning Community Park, Moraine State Park, the submarine USS Requin, Skyview Radio Society, Breezeshooters hamfest and a couple other locations. At the parks, my antenna of choice is a multi-band jumper based on a design by K3RLL. Also, I’ve experimented at the parks with a couple other antennas such as an end fed random wire similar to my random wire here at home. Before long the streak took on extra meaning. It showed and continues to show, that a minimal setup like mine really does work, despite the skepticism of some hams who believe you must use as much power and as big an antenna as possible to work anyone, especially DX stations. 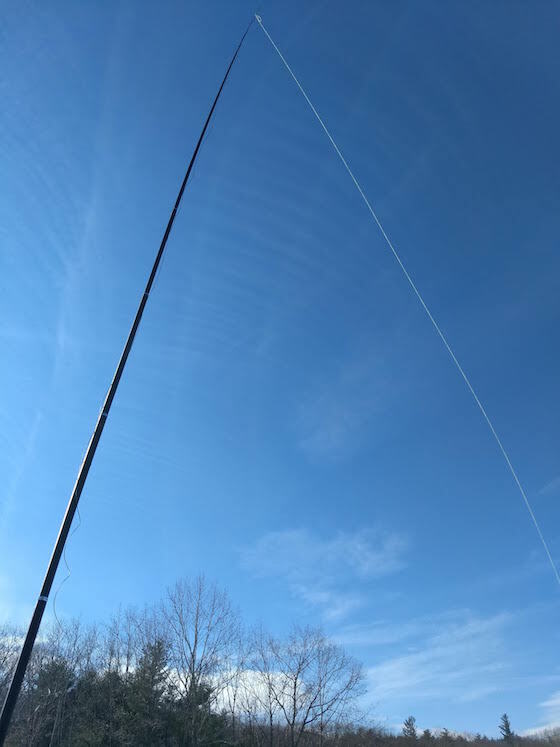 It has encouraged many hams who live in situations where they can’t use high power or big antennas to get on the air anyway with their own minimal setups and enjoy this wonderful hobby. Of course, what makes the success possible is the extreme efficiency of Morse code. With other modes you may indeed need the skeptics’ QRO and big antennas to succeed, but definitely not with CW. That is the most personally satisfying aspect of the streak for me. I’m delighted it has brought happiness to so many people. Although some days it was hard and took some time to find a QSO, the streak continued on and on. When my friend Mike, AB5XP answered my 30M CQ on April 30, 1997, that brought the streak to 1000 consecutive days. A major change in the streak as well as in my ham radio career came on September 1, 1999. On that day I purchased a Kenwood TS-570D transceiver – the first time I had ever used a commercial transmitter, as well as being the first transceiver. As soon as I unpacked it, I did two things. I put the microphone away in a drawer where it remains lost to this day. When I turned it on, I set the power to 5 watts output where it and all my rigs have remained to this day except for 3 experimental or accidental QSO’s that I don’t count in my streak totals. I used the 570 at QRO just to see how easy it was to work DX on 80M with high power. It was so easy, there was no satisfaction to it. I learned from those 2 QSO’s what I had always known. QRP is the way to go in ham radio to derive maximum satisfaction from the hobby. Later the third ‘accidental’ QRO QSO took place as described a little further on in the story. Conditions were then getting better and better as the sunspots were starting to increase, and more and more DX QSO’s started showing up in my log. By the time my streak reached 2000 days on January 25, 2000, when Bill, N4QA answered my 40M CQ, the bands were really alive and hopping. My interest in ham radio suffered a blow early in 2001 when my mother passed away after a six week battle in the hospital and a nursing home. She was 95 years old, and we’d lived together for all my life. For the past several years she had been in good health but needed me at home to take care of her, which I gladly did. I did not want to see her spend her last years in some uncaring nursing home. So her passing affected me quite a bit. One of the things that happened was that I lost some of my interest in hamming. I don’t really know why, unless it was because my mom always supported my hobby and she loved looking at all the DX QSL cards I would receive, especially those from her native Italy. For most of the rest of 2001 I did not enter as many contests as usual nor did I chase as much DX as before. However, the streak still continued during all that time. Gradually I did start to get back into the bigger contests in earnest by the end of 2001 and set personal records in such contests as the RSGB 10/15M, Ukraine DX, OK/OM, ARRL 10M, and others. Then in early 2002 I really hit some of the bigger contests quite hard. In the January NAQP, I had a rate of 51.4 for the full 10 hours of the contest. The February ARRL DX contest saw me break the 600 QSO barrier for the first time ever with 633 QSO’s (and every one passed the ARRL log checking procedure of which I am proud). I continued to set personal best marks in many other contests in 2002 even though I still was not entering as many nor putting in as many hours as I once did. Sometime early in the 2000s, a mailman delivered some QSL cards to me. It turned out that he was also a ham radio operator, and we became fast friends. Along the way, I gained a convert to CW and QRP. Previously most of his activity had been on that phone(y) mode of SSB with higher power. 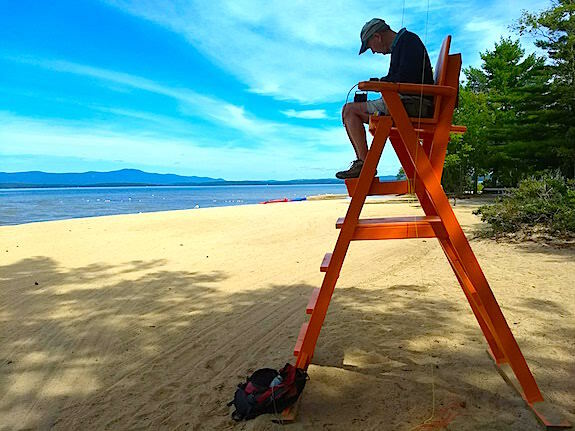 Now with a few exceptions for emergency work, he is a very dedicated QRP/CW/simple wire antenna operator also. I’m talking about Mike KC2EGL who is often mentioned in my diary and who in fact, has written a few diary entries for me. One goal was reached during the streak when I worked J45RW for my QRP country # 200 on July 27, 2002. New countries had been coming very slowly and continue to do so since I still don’t devote all that much time searching the bands for new ones. I do mean searching because I NEVER use any kind of spotting to find the stations I work. However I’m proud to have made it to 200 with just 5 watts and simple wire antennas. When I worked several of you starting with AA1SP on October 21, 2002, that extended the streak to 3000 consecutive days. In November of 2003, my cousin Virginia whose health had been declining a bit asked me to stay with her a few days after Thanksgiving while her husband was away on a hunting trip. It happened that included the weekend of the CQWW DX contest. I thought I’d try setting up there for the contest as well as for my streak QSOs. She lived outside the river valley in which I live, and I was curious to know how conditions would be there without the surrounding hills. It turned out there was a world of difference. The QSOs came much easier there even with just a simple end fed wire about 70 feet long running down from ‘my’ bedroom to a grape arbor in their backyard. The story of the contest can be found among other contest stories in the CONTESTING section of my website so I won’t dwell more on it now except to say that my streak QSOs from 11/29 through 12/2 all came from Virginia’s house. Now I set my sights on making it to 10 years, and on August 4, 2004, I reached that goal. Helping me complete the ten years with QSO’s on that day were: K4IR, N4CU, NB6M/MM, WE8UP, WD9F, WB5BRD, KS4OY, VE3AIJ, VA3RE, N4FI, & K3DQ (whom I realized when typing this was my first QSO when I became active again on February 15, 1993). Thanks to all of you. About a month before the 10-year point of the streak I got a request from a reporter for the local newspaper to let him write a story about my ham radio activities for the paper. As with the start of the streak, I didn’t realize that this event would also be the start of something. It turned out the reporter was also a ham radio operator. I had read his articles in the paper, but never knew he was a ham until we talked about the article. I’m talking about Tom Mitchell, KB3LFC (now WY3H). Tom and I quickly became fast friends since his interests in ham radio were also CW, QRP, and simple wire antennas. He had been inactive and was just getting back into ham radio about that time. That was why we had never worked each other on the air despite our similar interests. Not too long after the article was published, I again was contacted by Tom. This time he asked me if I was interested in helping him start up a new QRP club. 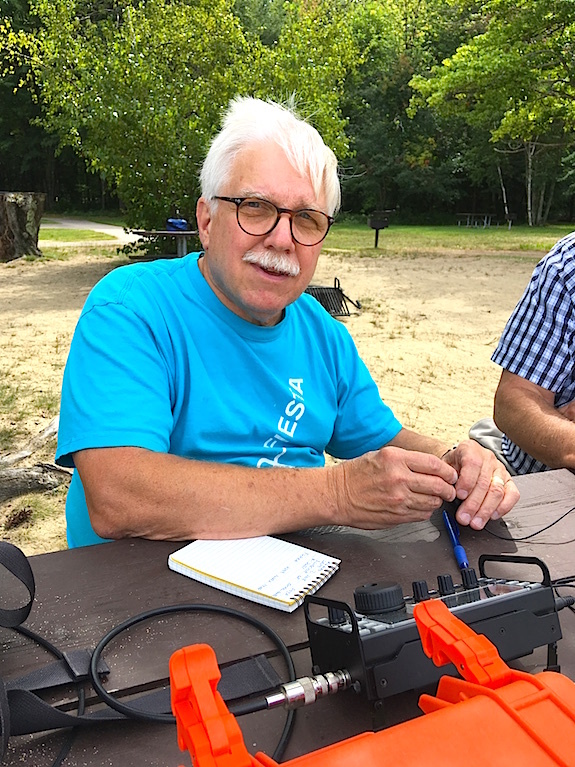 To be honest, and Tom knows it, I thought there were too many QRP clubs already. However, Tom said this would be a QRP CW club and would place emphasis on minimal QRP operation, i.e. using simple wire antennas and only using CW, no other modes. Well, that immediately piqued my interest and I said I certainly would be interested if the club stuck to those ideals. 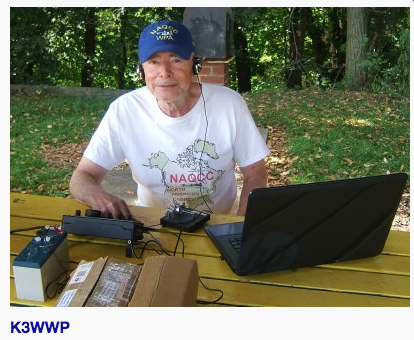 He agreed it would, and the North American QRP CW Club (NAQCC) was born in October of 2004. Tom was the President, and I assumed the post of VP. Although my duties with the club which included being the webmaster for the club website, processing awards and contest results, etc. took away from my on air time, that was countered by the club activities encouraging me to get on the air more. I felt the club, dubbed “The QRP Club With A Difference” was doing things that other QRP clubs were not, and I really enjoyed the club awards program, the monthly sprints, and something I think is unique, the monthly Challenges. An example of a Challenge is making 30 QSOs on 30 meters in a month. Another is to ‘get’ all 26 letters of the alphabet from the call letters of stations you work or to make up a pre-selected list of words about a certain theme in the same way. Each month we try to come up with something different but all have the bottom line of just trying to get more CW activity on the bands to help preserve this wonderful mode. If I’ve piqued your curiousity and you want to know more, visit the club website at http://naqcc.info/ and be sure to watch the video there. Shortly (18 days) before the 11 year mark was reached, I hit 4,000 consecutive days. I had planned to work as many stations as possible that day, but the death of my cousin Virginia that very same day changed those plans. I did work VE1XW, HI8RV, WZ2T, KC0TLN, and NB9D on the 4,000th day, but I would have liked to have worked a lot more of you since so many have expressed such an interest in the streak and followed it closely over the years. During the 12th year of the streak, my activities consisted mostly of just continuing the streak, some contesting, the aforementioned NAQCC activities, and a little DXing when conditions permitted. My DX total entities remained at 204 as limited time and poor conditions kept me from working any new ones. In April 2008, Mike loaned me his TS-480SAT rig after he bought an Elecraft K2 as his main rig. The 480 became my main rig until October 10, 2011, and the 570 was relegated to backup or standby status for a while, and now it is on loan to Eric KB3BFQ who has resumed his ham radio activity after a layoff for a while. The 480 gave me another band to play with – 6 meters. It was on that band that my 3rd QRO QSO happened. As with the 570, the power was set to 5 watts on all bands immediately. However, Mike and I missed setting the power on one of the three 6 meter positions. So my very first QSO on 6 meters with a VE2 station was done unaware at the time by me at 100 watts. Before making another QSO there, I noticed the LED power meter was lighting up a whole lot more segments than it should, and I set the power correctly back to 5 watts. End of my QRO confessions. HI. As the streak continued to get longer and reached the 15 year mark, it continued to provide an incentive for me to be active on the ham bands. That activity provides continued satisfaction and thrills for me. There were many highlights as the streak continued. Among them working Desecheo Island and later Navassa Island meant I now have all NA entities worked and confirmed. Another highlight along the way was working VK6DXI near Perth in Western Australia on 40 meters via long path while the sun still hadn’t set here. I had to email VK6DXI to find out for sure it was a legitimate QSO, and he confirmed it was. The QSL from that contact is displayed on the main page of the DX section of my web site. Perhaps one of the biggest thrills was working Hawaii on 80 meters not once but twice, and almost three times in the 2009 ARRL DX contest. Our 50th state became my 49th state on 80 meters. I still need Alaska for an 80 meters WAS. On October 10, 2011, I had another major change in the streak. 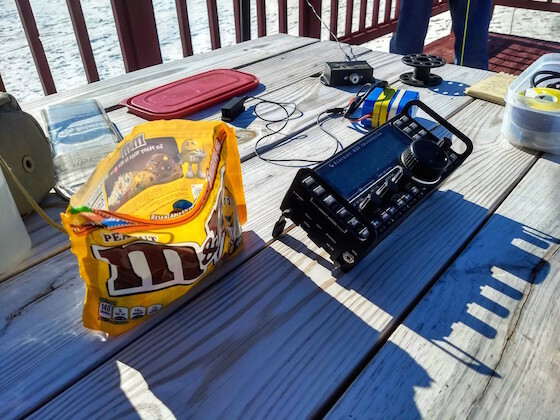 From that day on for about a year until something even better came along, virtually all my QSOs came on an Elecraft K2 which I used on loan from Mike KC2EGL for a while, and eventually in early 2012 purchased it from him. The fantastic receiver in the K2 made a big difference in my battle against local man-made QRN. I could now dig out much weaker signals than before. I also got Mike’s KX1 and have used it for portable operations. That’s the one I helped him build as a NAQCC project back in 2008/2009. In 2012, Mike bought a KX3, the latest at that time (and in my opinion, greatest) of the Elecraft rigs. After using his and seeing how good it was, I had to have one of my own. I purchased and assembled it in October 2012, and have used it virtually exclusively since then, even for portable operations since its small size makes it ideal for both a home rig and a portable rig. Its excellent filtering helps in eliminating my local noise as well as separating stations in crowded conditions. In fact, it is so good, it’s hard to tell there is a strong station just a few dozen Hz or less away from the station I am working. The ease of setting up for split operation when chasing DX is another great feature among many more that I won’t go into here. One thing I will add though is the computer interface which allows the firmware to be updated regularly. It’s like buying a new rig for free every so often. Also, the computer interface allowed the use of a panadapter (HDSDR) to scan the ham bands. That is a tremendous time-saver when you can look at a computer screen and immediately see all the activity on a large portion of each ham band. No more laborious tuning across the band and listening for activity. Since I started using a panadapter early in 2013, it has saved me countless hours while continuing my streak. The HDSDR was eventually upgraded to the Elecraft PX3 which was specifically designed to work with the KX3. It proved to be even better than the HDSDR. I think the KX3/PX3 combo is the absolutely most perfect QRP/CW setup in the world. One particularly enjoyable aspect of the streak was doing what Mike KC2EGL and I christened ‘tag-team’ efforts. 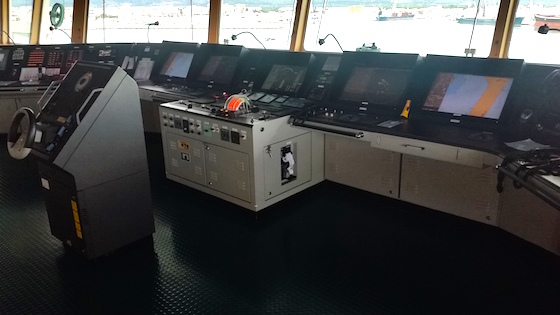 That is where one of us would work a station in my shack with our own call, then switch operating positions for the other one to work the same station with his call. Eventually we also simply set up dual headphones and keys to eliminate the jumping around in the faster paced contests. We did that for many contests and for working many DX stations outside contests. I’m not sure just when we started that, but it peaked in early 2013 when Mike was off work recovering from a shoulder operation. Also in 2013, March 1 to be exact, I started a DX streak with the same qualifications as the main streak except that one (at least) QSO a day must be DX, i.e. non-W/VE. That continued until it came to an end when I couldn’t find any workable DX on August 2, 2018, just 20 days short of 2000. That streak is written up in a separate page, so no need to describe it further here. Summing up now. All QSO’s in the streak came without any special arrangements. No skeds or regular net check-ins were involved in extending the streak. I just got on the air each day and called CQ or answered someone’s CQ for my QSO. Even if I did have a sked with someone to give them Armstrong County or some other reason, I’d always make it a point to get another random QSO that day. The readers of my web site diary tell me it would be OK to make a sked with someone to insure the streak continues, but I’m hesitant to do so. One other thing requires mention. I never signed /QRP after my call to attract attention to the fact I was using QRP. I don’t believe in doing that anyway. I’m just a normal ham operator who happens to use QRP. I don’t know if a streak this long could be maintained under the same conditions using another mode than CW. At least I’m sure it wouldn’t be as easy. I’ve never come seriously close to missing a day, although on a few days here and there it took a lot of listening and/or calling CQ before a contact came along. Most of the time I got that first QSO of the day during the first hour of the day. The 0100Z hour provided the second highest total. The latest time to get that first QSO was 2311Z back on 14 Feb 1995 when I worked EA8/DJ1OT on 30M. That was the only first QSO that came in the 2300Z hour. Twelve came in the 2200Z hour. Most of those late hour QSOs came before the streak was all that well established. Now on to some statistics for the first 24 years of the streak. Notice I said the ‘first 24 years’ which means I have no intention of ending the streak just yet. It will continue to go on until some unforseen circumstance brings it to an end. 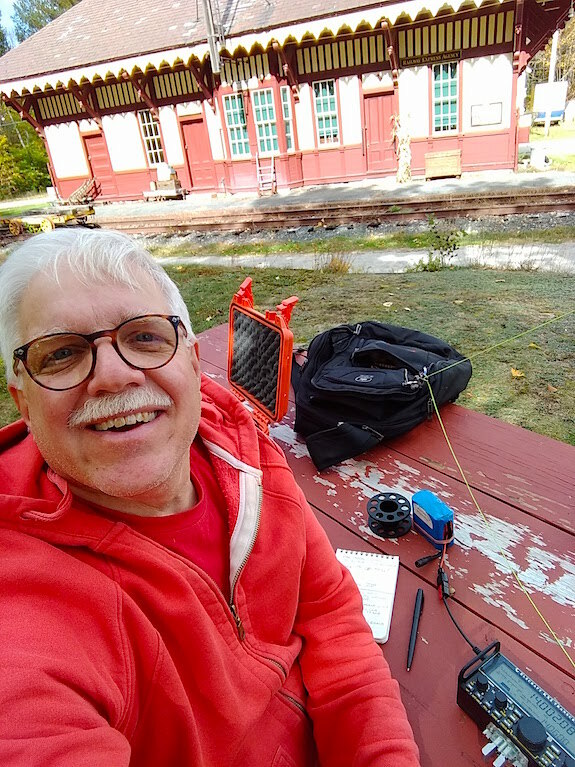 I would love to make it to 25 years as I think something like “A quarter century of daily QRP/CW/simple wire antennas QSOs” would sound very nice as a tribute to the effectiveness of QRP/CW/simple wire antennas. Dec 23    KB3BFQ received his ham ticket - he was the one who suggested the streak idea to me. Nov 29-30 Worked the CQWW DX contest portable from my cousin's house. Feb 15    480 QSOs in the ARRL DX contest - most in a contest in several years. Feb 9     I worked Bill W9ZN in Chicago for QSO # 90,000 in my 55 years of hamming. Feb 17/18 Only 116 QSOs in the ARRL DX Contest. Lowest total in several years. 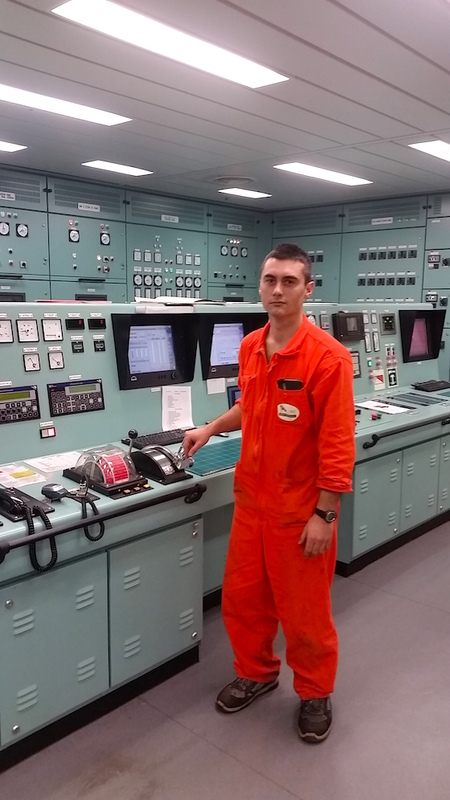 Jun 3     Operated the Museum Ships on the Air activity from NY3EC, the USS Requin moored in Pittsburgh, with Mike KC2EGL and Art WA3BKD (sub caretaker). 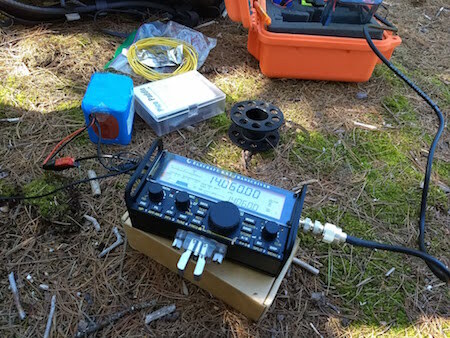 This was an independent activity and we used QRO power to make as many QSOs as possible for the Requin's results in the event. Jun 23/24 Field Day with Mike from my front porch. We made 482 QSOs total. Aug 2     For the first day since Feb 28, 2013 I failed to work a DX station ending my DX streak at 1,980 days. To reiterate, the purpose of my giving all this information about my streak is simply to show anyone who reads this that QRP does work well, even with simple wire antennas and a less than average location, especially with CW. If you are in a situation where you can’t use high power or put up huge antennas, maybe my results will encourage you to get on the air with a simple setup and give it a try. I guarantee that you will succeed and be able to enjoy the finest of all hobbies. Give it a try – you may never go QRO again. 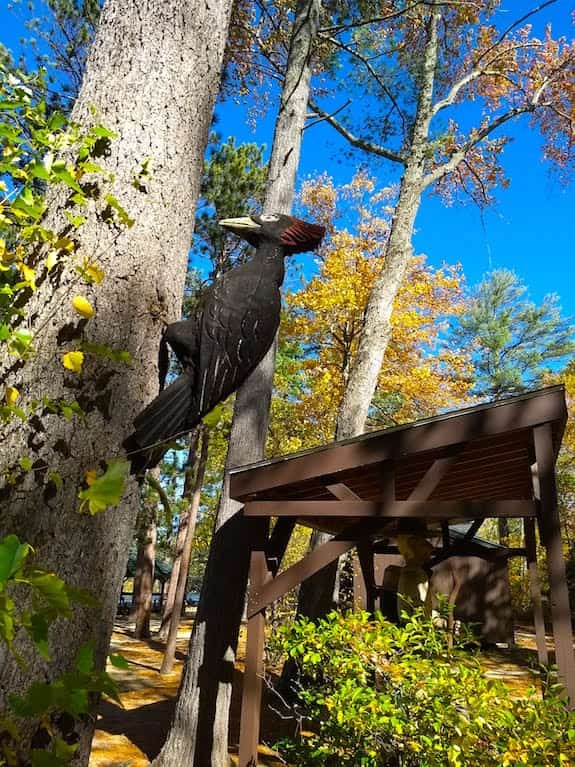 Yesterday I set up at Wellington State Park on a gorgeous mid-October day in central New Hampshire. 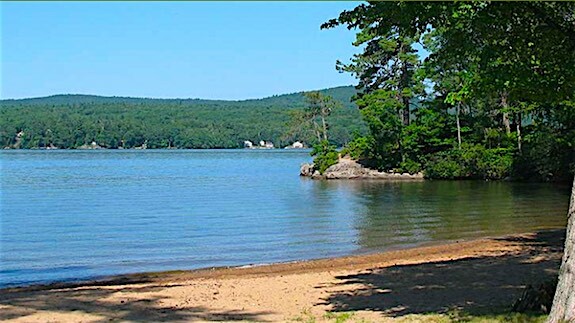 Wellington State Park is on the west shore of Newfound Lake. 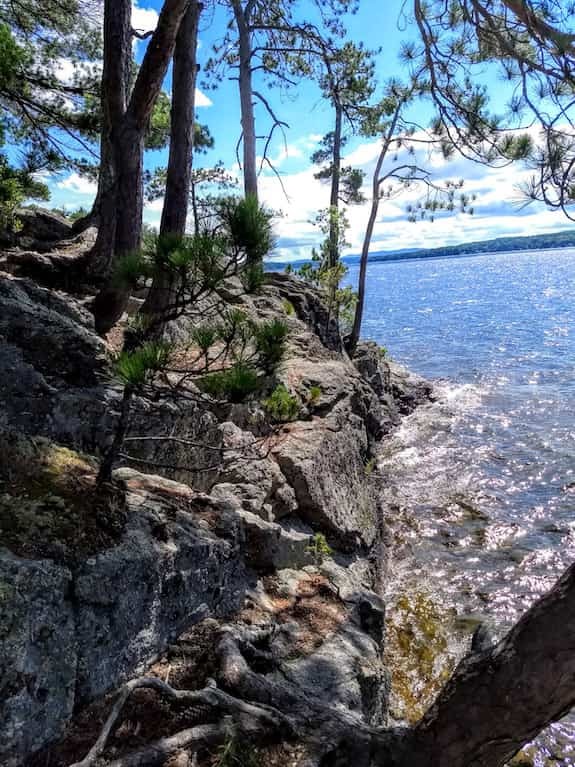 Local lore has it that this body of water has the cleanest and purest water of any lake in the state. Joining me on the adventure was Dave Benson, K1SWL and my friend JT better known as Jim. The sun was brilliant but it was offset by a stiff wind and temperatures that tried to claw their way to 50 F but never quite made it. New Hampshire had a hot and humid summer and the transition from heat to cold has been very rapid. All three of us complained about the wind that cut like a knife. Dave and I retreated to a picnic table nestled in some giant pine trees about 200 feet back from the beach. It had quite a bit of protection from the wind and had a splash of sunlight on it. Jim decided to saunter back to the parking lot to soak up the generous solar radiation that was in full force. His location had even more protection from the biting chill. Within minutes I was on the air with my Elecraft KX-2. I had put up my standard 29-foot vertical wire. The end of it was attached to a 9:1 unun. A 19-foot counterpoise wire extended from the unun across the carpet of pine needles. The counterpoise really helps get a perfect SWR match with the internal tuner inside the KX-2. It took at least ten or fifteen minutes before Dave and I found Stefan, DK1HL in Germany on 20 meters at 14.021 Mhz. Both Dave and I successfully made contact. Next up was Jamie, M0SDV in England. I was thrilled to have two contacts in the log because the propagation was not the greatest. We heard some stations, but they were weak or didn’t answer us back. Finally, I heard our dear friend Bert Banlier, F6HKA. I answered his call and then handed the iambic micro pico paddles to Dave. Watch the video below to hear part of the conversation between Bert and Dave. The chilly wind won the battle and we packed up to go find some hot coffee. It was great to get out but we left knowing we need to toughen up. Soon it will be below freezing and a foot of snow will be on the ground. Today I set up at Potter Place just west of Andover, New Hampshire. I’ve always come here in the past with my good friend Jim Cluett, W1PID, but today he was not feeling well. Before arriving I had driven northwest to Gardner Memorial Wayside Park. I was on a mission to try to locate Dave Benson’s micro Pico Paddles that he misplaced a week earlier. I had taken my battery-powered leaf blower with me. I was sure the tiny paddles were hiding beneath some leaves, but I had no luck locating them. This is a magical little park with a mesmerizing stream next to the two picnic tables. Just downstream is an old mill foundation. It was blustery and overcast while I was at the Gardner Memorial Wayside State Park, so I left to head back towards Andover, NH. Potter Place has a rich history. Richard Potter, a famous magician, lived here and the Boston & Main Railroad’s main line was here. 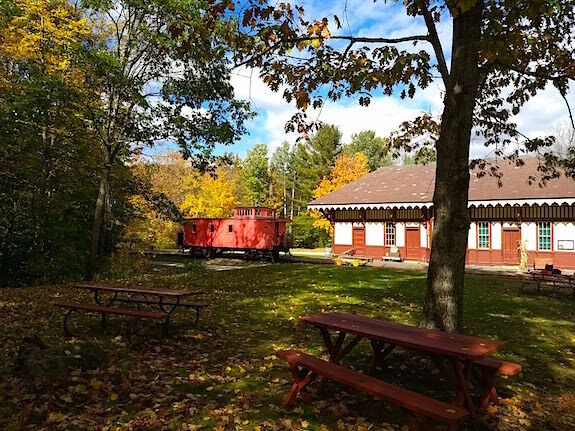 If you close your eyes, you can often hear in the distance a chugging steam engine and a train whistle. Those that can’t are non-believers when it comes to all things railroad. I ate lunch and walked around taking some photos enjoying the sunshine before I set up my radio. I think I was just trying to stay busy since Jim was not there. 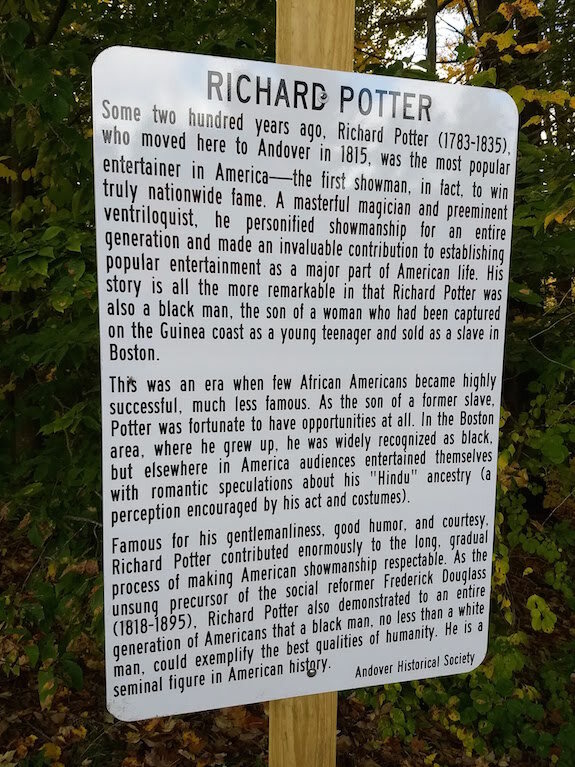 Richard Potter’s grave is just next to the railroad tracks and I’m hoping that somehow his headstone is restored because in another 200 years you’ll no longer be able to read his name. It only took me a few minutes to set up. One throw got my water bottle over the tree and within a few minutes, my 29-foot wire was attached to my 9:1 unun. 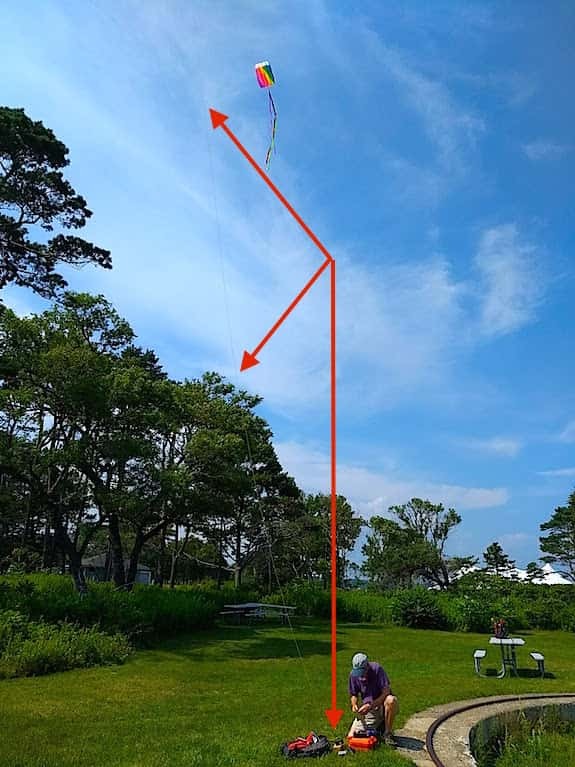 I decided to also connect a 19-foot counterpoise from the unun and it’s really helped me get a perfect SWR with my Elecraft KX-2. Within a few minutes of turning on my radio, I heard activity on 20 meters. I first heard a German station with a prefix of DK8, but I couldn’t make out the rest of his callsign. Minutes later I heard Gerald, PA3GEG calling CQ. I responded and he heard me. What’s more, he recorded our QSO! You can listen to it by CLICKING HERE. Next up I contacted Björn, DH3LLB. It was exhilarating as I was able to fully copy everything he sent. That’s a first for me. I only wish Jim had been there to watch me do it. I could have made more contacts, but I decided to pack up and head home. Next week I hope to get out with Jim and maybe Dave Benson. 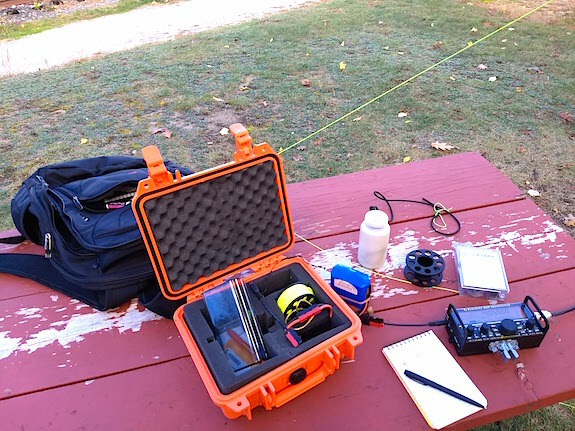 Soon the weather will be frigid, so now’s the time to get as many QSOs as possible in the stunning New Hampshire fall weather. 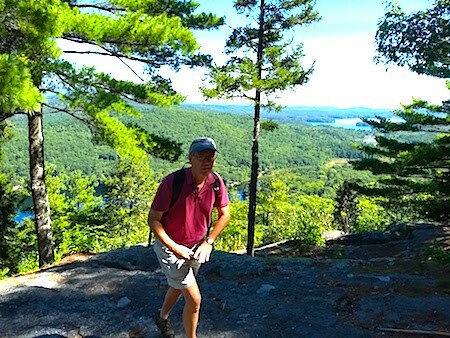 Today Jim Cluett, W1PID, and I hiked to the scenic Bald Ledge overlook about one mile east of Sky Pond in central NH. It was a perfect late-summer day with the temperature just above 80 F and a crystal-blue sky. 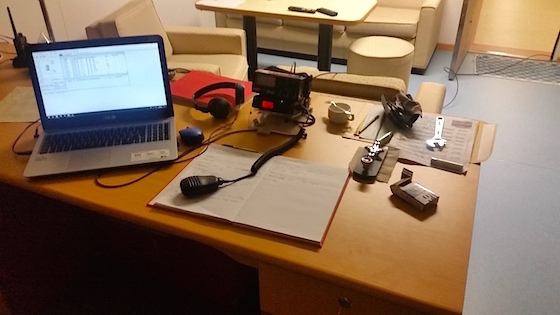 We intended to participate in the QRP-Afield event hoping to contact other radio operators who were using low power as were we. To get to the scenic overlook, you hike up a rugged Class VI road that’s not maintained by the town. Soon you have to turn left at a crude roadway blocked by an orange metal gate. Then you have to walk about a half mile to where the trail through the woods begins. If you pass the small sign, you could be in trouble. 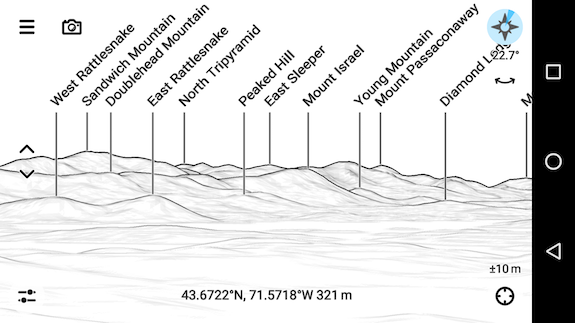 I decided to get the GPS coordinates this time in case you want to find the small trail. We passed a few hikers who were coming back from the overlook. When we arrived, we were the only ones there. Jim got absorbed in the view and I did all the work to get us on the air. Here’s the view of the Sandwich Mountain Range that captivated Jim. We had lots of fun and decided to leave. Our timing was perfect because just as we started back into the woods, a large group of twelve people and three dogs showed up. That would have been mayhem with all of my equipment out and questions coming at us faster than flies showing up at a picnic. Jim wanted to set up his APRS HT radio to track our journey home. It worked well. 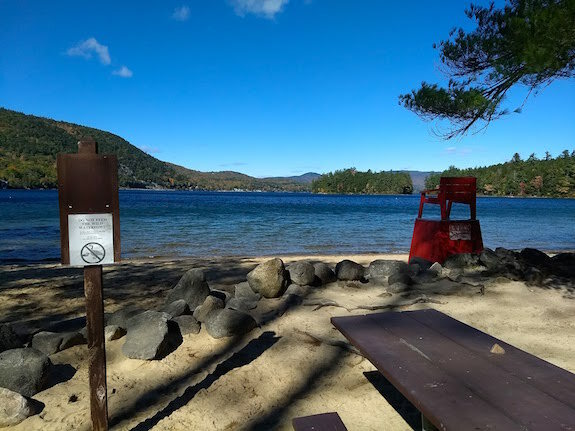 This afternoon I was fortunate to activate Ellacoya State Park in central New Hampshire. I had all sorts of help from Jim Cluett, W1PID and Norman Jackson, K1NAJ. 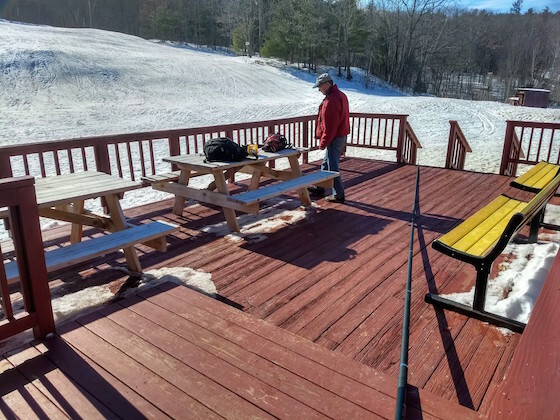 Norman had reached out to me itching to participate with an activation and I was determined to introduce him to the outdoor aspect of Parks on the Air. 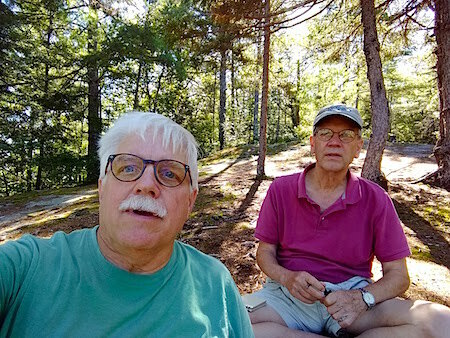 Jim had helped me a week before attempt to activate Ahern State Park, but we fell a few contacts short of a valid activation. You need to have ten contacts the same day to qualify for an activation. 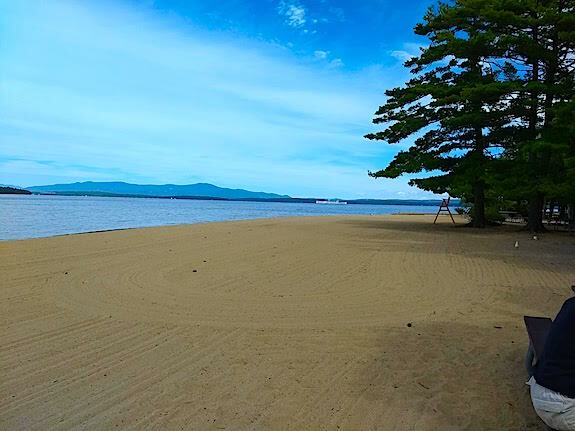 We set up on a picnic table just 30 feet from the lapping waters of Lake Winnipesaukee, the largest lake in New Hampshire. A few other people were there enjoying the delicious sunshine and low humidity. Had we been here just four days prior on Labor Day, we would have had to fight for a table and the beach would have been wall-to-wall people. The goal was to have fun, enjoy the jaw-dropping weather, and make ten contacts with other radio operators in that order I might add. We decided to use my radio gear and I didn’t waste any time throwing my water bottle about 50 feet up in the air over a pine tree branch. The placement worked well as it allowed my 29-foot antenna wire to hang vertically without touching any of the other branches or needles. I was able to get the top of the antenna wire 40 feet up in the air. While I was getting ready to get on the air, Jim decided to set his radio up about 150 feet away. 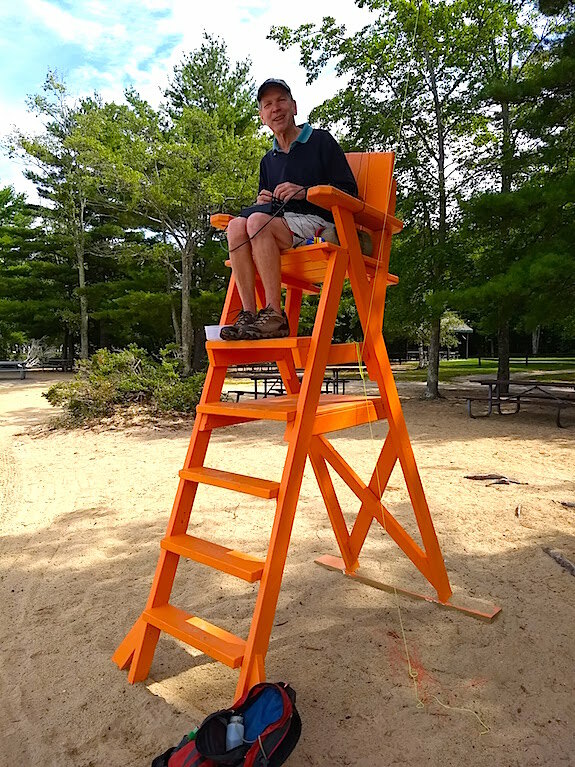 He spied a lifeguard chair and was determined to operate from this perch above the warm sand. As soon as he turned on his radio, he was able to hear and communicate with his good friend Bert in France, F6HKA. Once Jim finished his conversation with Bert, I jumped in so I could log my first contact. I needed ten QSOs to qualify as a valid activation. I thought it wouldn’t be a problem and we’d be done in short order. Bert heard me and we had a brief conversation at 12:50 pm. Look at the times and you’ll see it took quite a while to get the ten contacts. We tried to contact him, but he didn’t hear us. It would have been a rare opportunity to send back a signal report like 593 as there’s no way he deserves a 9 for the tone part of the RST. A few other people were enjoying the late summer day, but we were all outnumbered by tame ducks and aggressive seagulls that had been spoiled all summer long getting food handouts from many people who visited this wonderful state park. The gulls would steal food from the ducks and squawk raising quite the racket. My guess is there were just under 100 gulls resting on the beach and perhaps ten ducks. 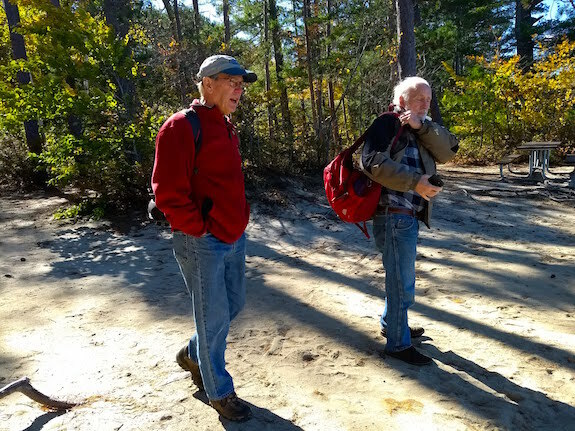 Jim, Norman and I had a marvelous time and this beach is a great place to spend a warm late spring, summer, or fall day. I don’t recommend coming here to do radio in July unless you want a beach ball bouncing on your radio or knocking your antenna out of a tree! A cheap HF antenna can be made using a simple piece of wire. You can’t get much cheaper than that. Yes, a giant yagi antenna on a tower would be ideal, but you said you wanted cheap. The key is the wire can only be one of a few lengths if you want it to work on just about all the high-frequency (HF) amateur radio bands here in the USA and the rest of the world. It’s important to realize that an antenna that is a half or quarter-wavelength of the band you’re working on will create a very high impedance and your tuner will not be able to give you a nice low SWR. The second point can be quite a challenge. Fortunately, Jack, VE3EED got out his trusty calculator and did all the work for you. What are Ideal Lengths for a Cheap HF Antenna? Jack’s a silent key and I know I’m thankful for the work he did to come up with the lengths you can find in this column. 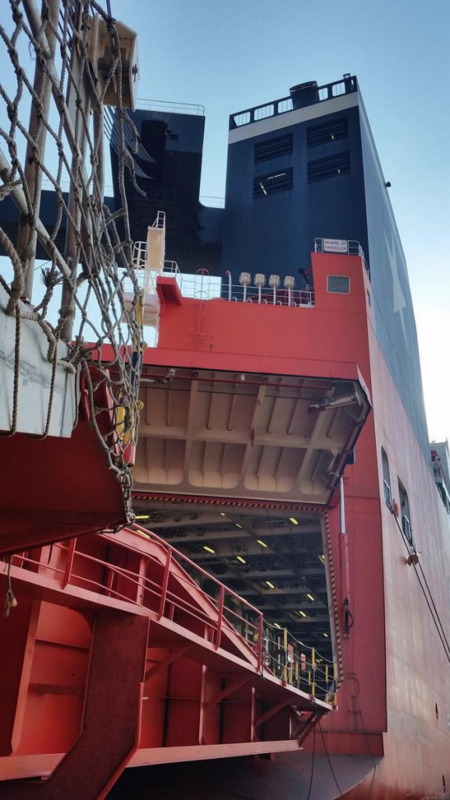 Do You Need A Counterpoise Wire? I find a counterpoise about 17 feet long works well if I want to get on 40 meters. You can experiment with different lengths. 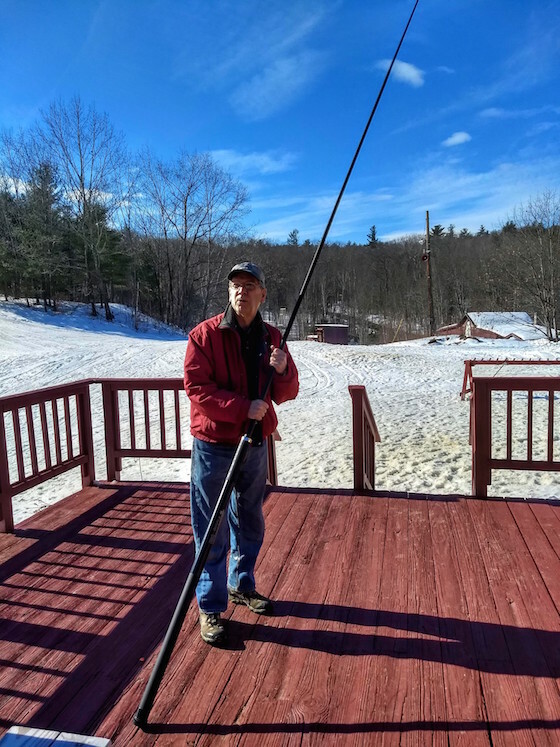 Steve Galchutt, WG0AT, uses a 58-foot wire length with a 25-foot counterpoise. Do You Need a Balun or Unun? 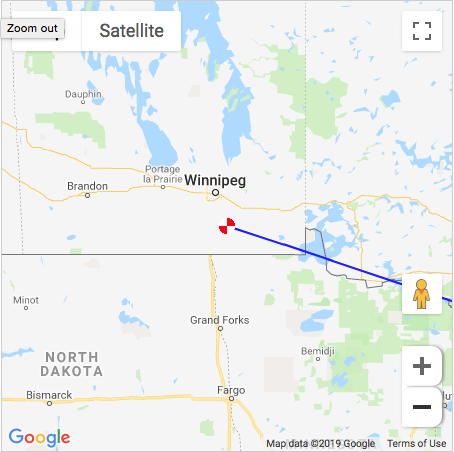 I connect my 29-foot cheap HF antenna to a 9:1 unun to lower the impedance. This makes less work for the tuner and I can almost always count on a very low SWR using the internal tuner in my Elecraft KX3 or KX2. 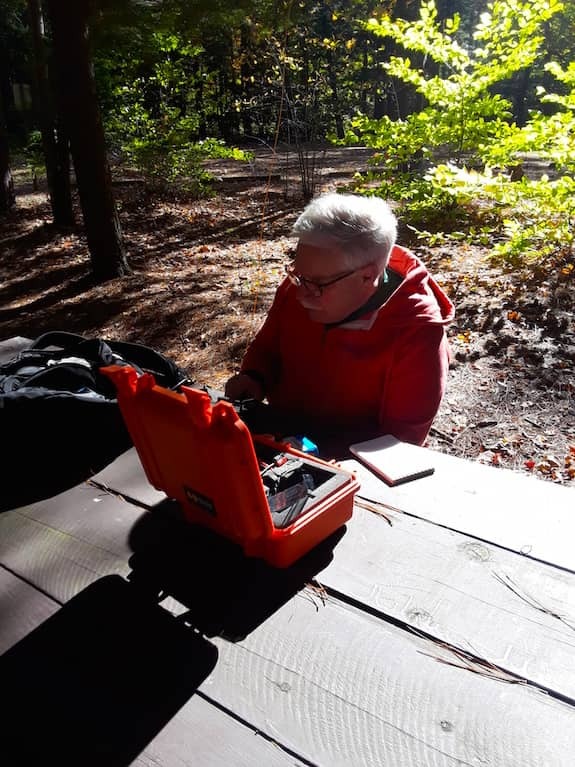 Yesterday my good buddy Jim Cluett, W1PID, and I decided to try to activate Ahern State Park along the eastern shore of Lake Winnisquam in central New Hampshire. I’d been there at least three other times, but it was a first for Jim even though this magical place is less than six miles from his house as the eagle flies. The two previous days were blistering hot with temperatures above 90 F and a dewpoint kissing up against 70 F. That translates to sticky and steamy. Overnight a cool front was bulldozing in a lobe of cooler dry air so it was a perfect day to get out to do some outdoor radio. 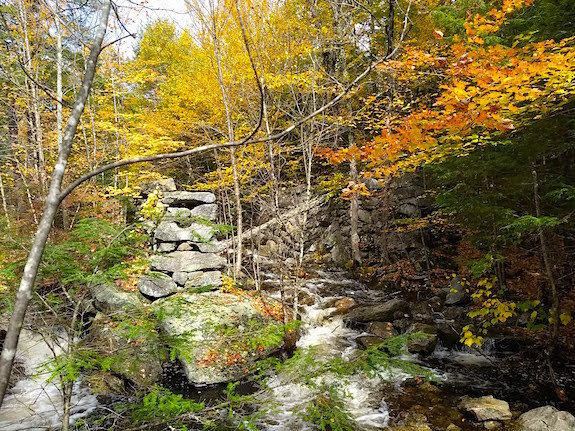 Ahern State Park is perhaps one of the best-kept secrets in central New Hampshire. You enter the park off a driveway that leads to the old state prison and reform school. Thousands of people, I’m sure, drive by and fail to see the old brown state park sign that’s about 200 feet off State Route 106. As you make the turn into the park, you start to bump across a dusty well-worn gravel road that seems to lead to nowhere. For the most part, Ahern is a nothing park. It’s undeveloped in the sense that the only improvement is the gravel road. The reward for absorbing the pothole punishment is a sandy beach in a sheltered cove that soaks up the warm afternoon sun. 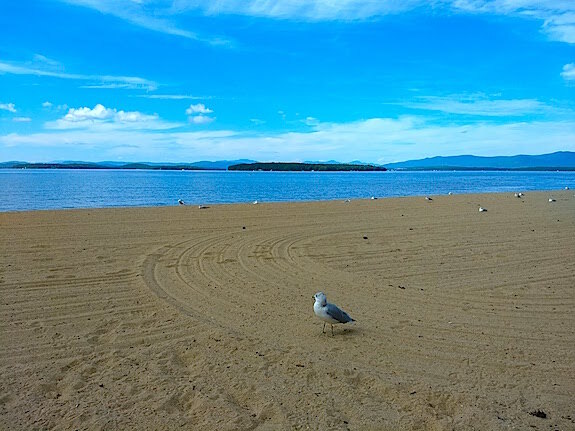 Once you exit your car in the turnaround circle at the beach, you’ll discover there are no picnic tables, no shelter, no nothing other than a dramatic view across, up and down Lake Winnisquam. 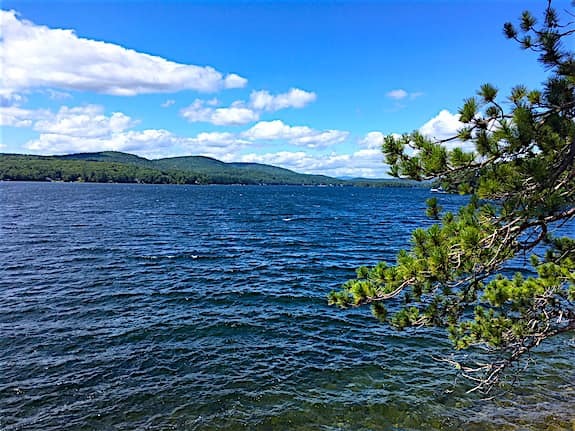 This crystal-clear body of water is the third largest lake fully within the boundaries of the great state of New Hampshire. 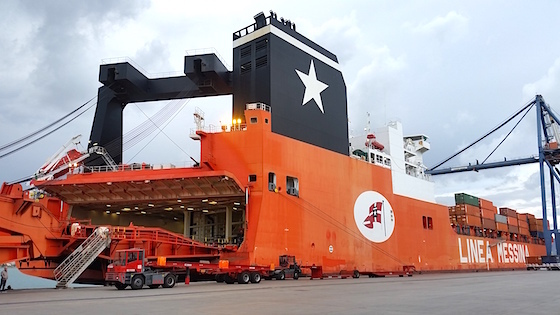 It boasts 7.2 square miles of surface area. 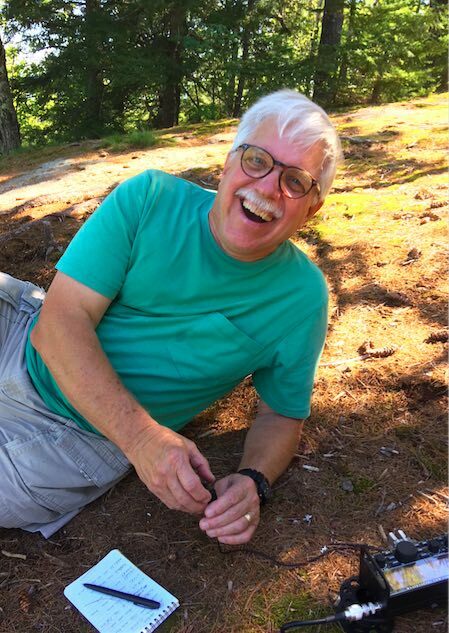 Jim loves the outdoors and I doubt I’ll ever get him hooked on Parks on the Air (POTA) activations. 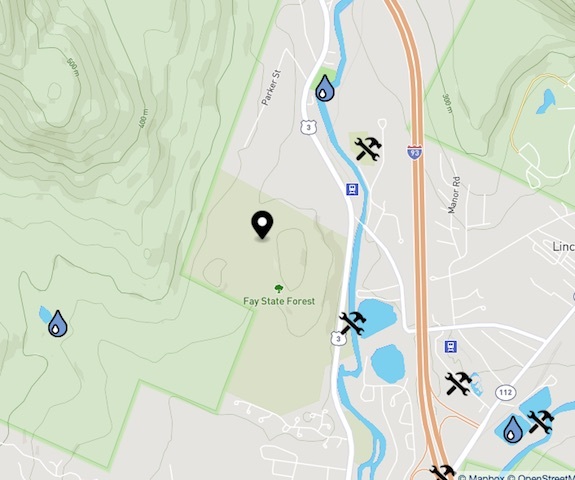 Just five days earlier we had activated Fay State Forest here in New Hampshire using my call sign. He just enjoys being outdoors and if he can collect a few Qs, or contacts, as we call them, it’s all the better. I must say Jim makes a great teammate as his radio skills are far beyond mine. He’s been a radio operator for 50+ more years than me. It was just six years ago I got serious about the hobby. Sure enough, there was a small trail just behind the beach. There were no signs telling you anything, you just had to be brave and believe. As we walked up a slight grade next to a rotting pine tree, I could tell the view was going to be spectacular. I could see three miles down the lake and another three up the lake. Just across from us was the fabled Steele Hill and Ladd Mountain that’s not much more than a hill rising up behind my home. “Watch out for the dog doo,” Jim announced as I was soaking up the stunning view. The cool front had picked up speed and the wind was whipping up whitecaps on the lake. Some previous visitor must have had a large dog and it relieved itself right where we decided to set up. There was lots of doo to deal with. 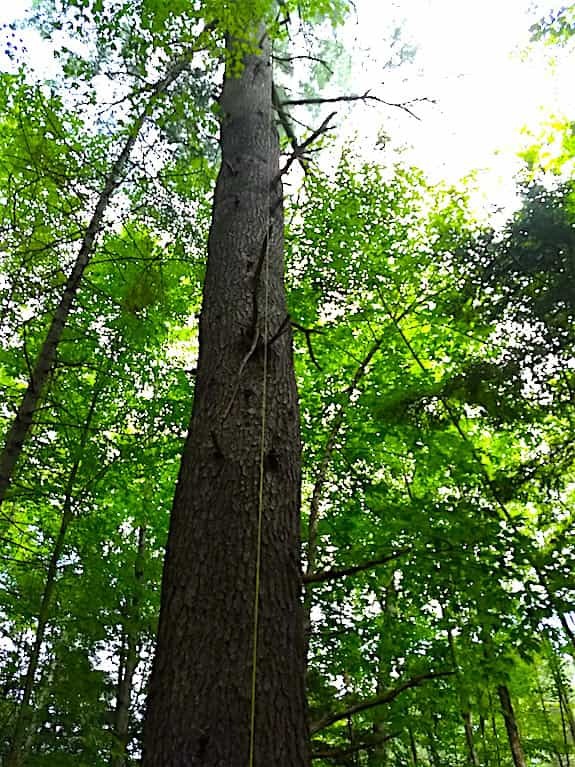 “These two trees are just far enough apart that we can set up the 44-foot dipole,” Jim exclaimed. We used all my equipment including the dipole I modeled after one that Jim has. You can make one using thin 26-gauge twisted-pair wire. It connects to my Elecraft KX3 with a standard banana plug. The internal tuner in the KX3 has no trouble at all delivering a satisfactory SWR. The flat dipole was about 40 feet above the water and the axis of the wire was roughly on a north-south line. This means the signal should radiate pretty well to the east and west. As soon as we powered up the radio, I went to 20 meters. It was quiet and there was not much activity. 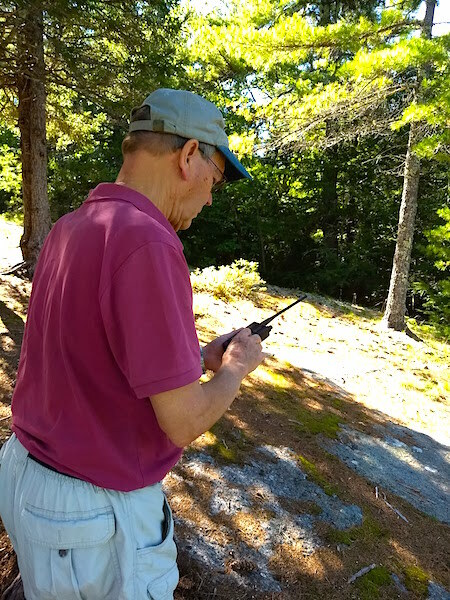 I did hear one faint signal and Jim was able to copy Norm Jackson, K1NAJ, on a ground wave as he’s a fellow NH operator. My guess is Norm was probably just ten miles, or less, from us. 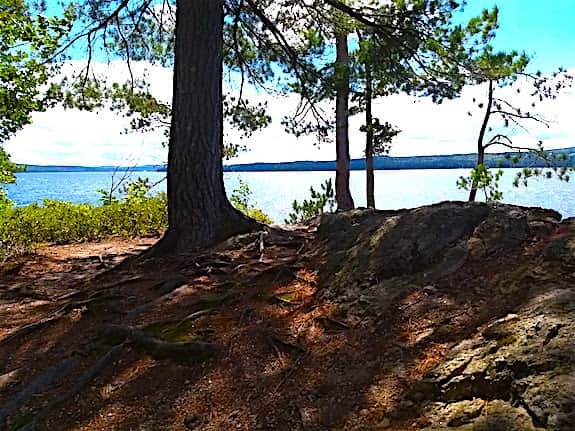 Jim was sitting on a rounded piece of the Meredith Porphyritic Granite in a trance looking out across the water. I could tell he was really enjoying this magical place so close to his home. 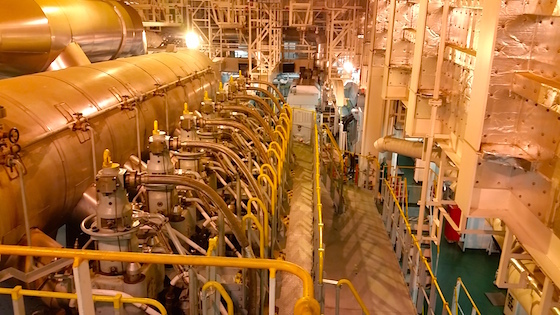 “Switch to 40 meters and see what’s happening,” Jim suggested. I often wonder if he’s not a soothsayer as that band had lots of strong signals. Soon we started to make contacts, one of them a park-to-park contact with KD8DEU. You need ten contacts within 24 hours on the same day to activate the park. We came up five short because the cranky sun is asleep. We’re at the bottom of solar activity in the eleven-year cycle and this can make low-powered outdoor radio quite a challenge. I had a great time but the wind made it hard for me to hear some of the stations. I’ve got some occupational hearing loss that I sometimes struggle with. That’s why it’s a great idea to have a teammate like Jim along who’s hearing is so much better than mine. I guarantee you we’ll be back with cushions next time on a brilliant autumn day. I’m hoping to get the required ten contacts so we get credit as well as the wonderful POTA operators who try to contact us. 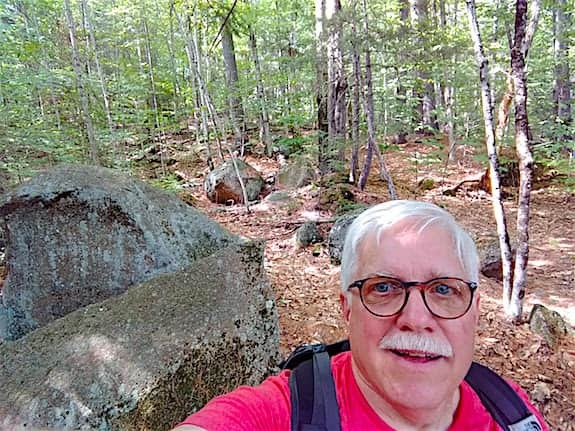 Today I activated Fay State Forest in New Hampshire as part of the Parks on the Air (POTA) program. 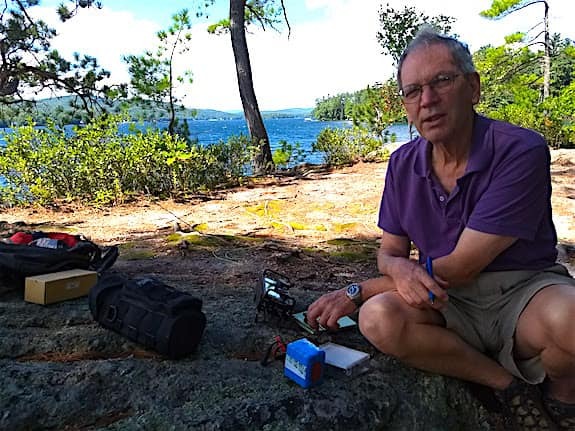 I did it with loads of help from my outdoor radio and CW mentor, Jim Cluett – W1PID. 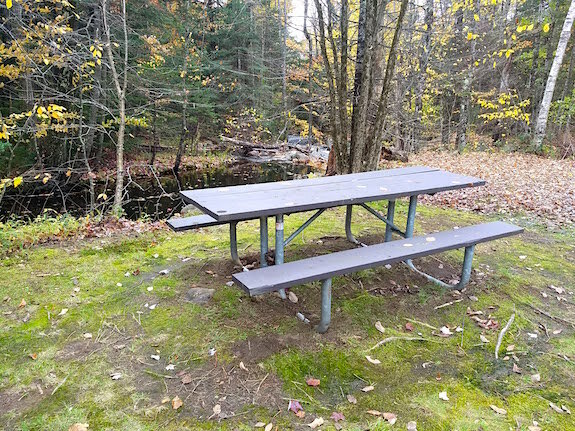 Kay State Forest is a small 200-acre piece of pristine forest just west of both Route 3 and Lincoln, NH. The southern boundary of the forest shares the Woodstock, NH northern town line. It’s an undeveloped piece of land with no roads or improvements on it whatsoever. We discovered a small gravel turnout on Route 3 just 100 feet north of the sign welcoming you into Woodstock. Much to our surprise, there was a well-worn footpath leading you into the magic forestland. We were glad to not have to bushwack up into the trees to find a place to set up my Elecraft KX2 radio. Jim and I saw what appeared to be a loop trail and we made a left turn to proceed clockwise around the trail. The path was covered with a carpet of soft brown pine needles. It was like walking on a pillow. 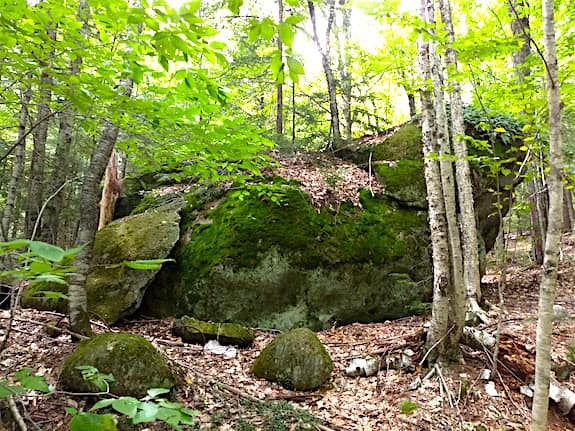 Giant boulders plucked from the bedrock by the last period of Continental Glaciation were strewn about the forest. We even contemplated setting up on top of one that must have been 15 feet tall and 60, or more, feet in circumference. 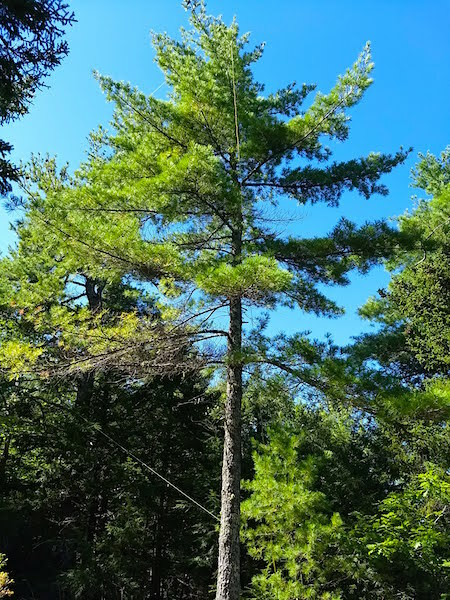 After walking just ten minutes we could tell we were on our way back to my truck so we decided to use a massive 200-foot-tall pine tree as our antenna support. Jim used my water bottle and made a remarkable throw at least 50 feet up into the air snagging the perfect branch so we’d have a vertical antenna. He wanted me to make the throw at first to a higher branch, but I thought the challenge was too great. Little did I know he’d carry the day in more ways than just this throw. Earlier in the day, I had posted on the POTA Scheduled Activations page that I’d be on the air by 1730 UTC, or 1:30 PM Eastern Time. Jim and I were set up and on the air seven minutes early. 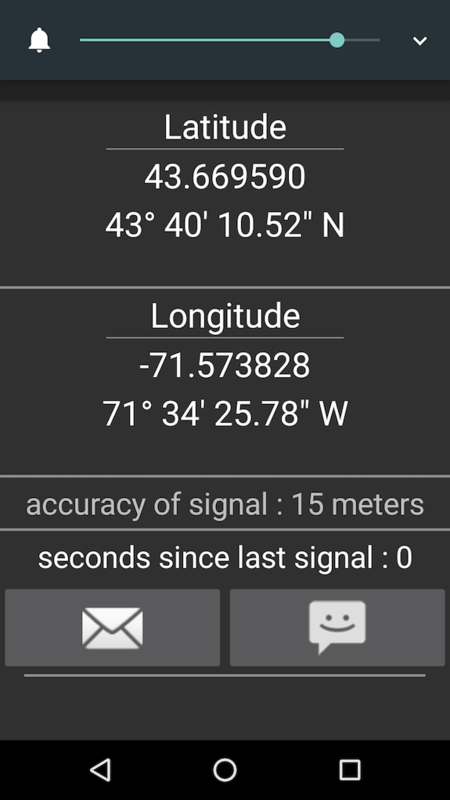 While I had posted the frequencies I’d be on, 20, 30, and 40 meters, I didn’t post a specific frequency. That’s hard to do because you never know if that frequency is already in use when you power up your radio. I called CQ POTA W3ATB W3ATB K4900 K several times hoping the skimmers would hear me and/or a POTA chaser operator. No one answered my call. My signal was heard by two skimmers, but it wasn’t enough to alert POTA chaser operators who might answer my call all at the same time. When that happens, you get a mini pile-up. I was hoping for that to happen as we drove to the forest. You can see my call sign and the 1730 UTC time stamp for today. 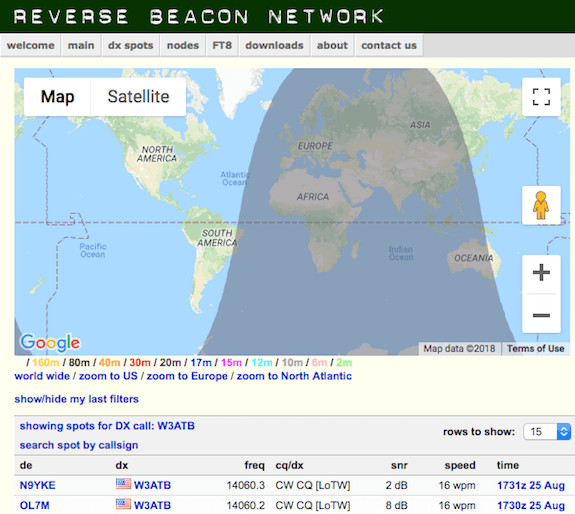 The Reverse Beacon Network is an amazing tool that helps you see who’s hearing your signal and how strong it is. We were fortunate that we did this activation on a weekend. Long ago Jim taught me that low-powered outdoor radio is very likely the toughest thing to do. The conditions can be challenging, the antenna might be marginal, and you’re lucky to be transmitting at, or above, 5 watts. If you don’t know much about amateur radio, that’s the amount of power you use to illuminate an incandescent night light. It didn’t take long for us to find activity. Fortunately, there were quite a few signals on 20 meters. The Kansas QSO party was in full swing and my log book started to fill up with contacts. We needed ten to activate this rare POTA entity. I was the first person in the USA to attempt an activation here, so I wanted to get the required ten contacts. My fourth contact was a DX one, OZ2TF, in Denmark. 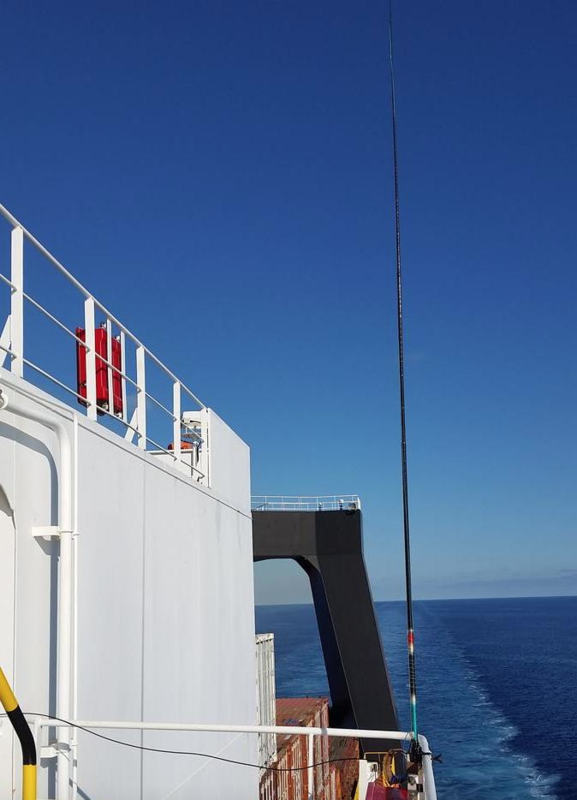 I was quite happy to see my signal was bouncing well off the waters of the Atlantic Ocean! Jim and I are lucky to live in New Hampshire and we regularly log European stations because the nearby ocean helps reflect our weak signals eastward. We milked 20 meters for all we could and switched to 40 meters. The Ohio QSO party stations were booming into us and in short order, we hit the required ten contacts. I was elated and Jim was happy to help log contacts. I have to admit the day turned out far different than what I envisioned. 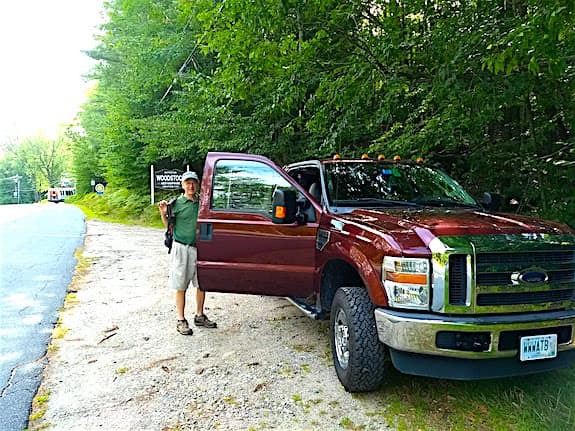 While driving to Kay State Forest I said to Jim, “Today you’re going to see what a well-oiled machine can do during a POTA activation.” Jim wisely didn’t respond. He’s more an actions-speak-louder-than-words type of guy. I’m very satisfied with the results of this activation, but as I drove back down I-93 I thought about how much I still have to learn. Just a few weeks ago I pronounced to Jim during the QRP Bumblebee contest I was a flippin’ operator. After today I wonder if I shouldn’t dial that assessment back a notch or two.